With it being a rapid growing economy in the South East Asia region, many foreign investors are seeking ways to expand their business activities in Indonesia. The Indonesia legislation allows the establishment of limited liability companies, which are preferred by entrepreneurs all over the world, with ease. Therefore, to register a company in Indonesia is much simpler compare to many Asia Pacific countries. 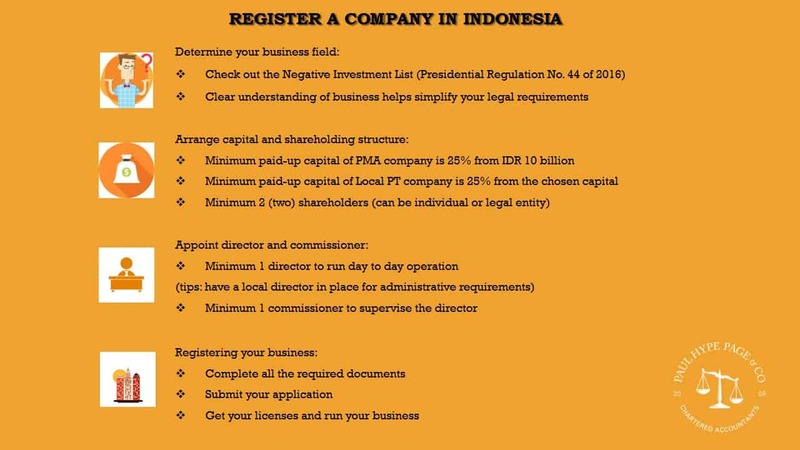 Before you register your business in Indonesia, you must first understand that there are 2 (two) main types of companies: Foreign Owned Company (Limited Liability Company) and Local Company. In Indonesia this is known as PMA (Penanaman Modal Asing) or PT PMA (Perseroan Terbatas Penanaman Modal Asing). This is a legal entity which foreigner can use to conduct commercial activities in Indonesia established under the Indonesia law. Based on investment law No. 25/2007 regarding investment in Indonesia, a foreign investment is defined as an investing for the purpose of running business within Indonesia. In a PMA, foreigner both individual and legal entities can be registered as shareholder. Shares of PT PMA can be owned up to 100% by foreign investors subject to the Negative Investment List. Foreigner’s ownership of PMA shares are classified based on the company’s business activities, and varies from 0% to 100%. However, some business activities may require Indonesian citizen or local legal entities to hold shares alongside the foreign investors. To find out which sector are open to foreign investment you need to check on the Negative Investment List, a list compiled and regularly update by the Indonesia Investment Coordinating Board (BKPM). In case a sector is partially closed to foreign investment, then the list states the maximum allowed percentage of foreign ownership. This means that you will need to have an Indonesia citizen partner in order to engage in business that particular sector. Based on Indonesia company law, every PMA should have at least 1 director, 1 commissioner and 2 shareholders. The shareholders can be either an individual (foreigner or local) or a legal entity, but at least one of the shareholders needs to be a foreign individual (or foreign legal entity). The director and commissioner can also be a shareholder. Commissioners are not part of the daily company management. But when it comes to owning company shares, they can although they are not required to have any. Note that PMA in Indonesia must have at least one commissioner. While choosing to have more than one commissioner, one of them must become president commissioner. This gives him or her the responsibility to be in charge of the board of commissioners. The ones that make your company’s executive management are the board of directors. They are the ones that are supervised by the board of commissioners. As for the director, they are in charge of company management in accordance to any policy that is appropriate by the Indonesian Company Law or AoA (Article of Association). Apart from having the right to legally represent the company, the directors are authorized to sign any contracts between the company and third parties such as vendors, suppliers and clients as well as the taxation documents. However, a non-resident director cannot sign documents on behalf of the company. Therefore, the director has to first process the work and stay permit immediately after he is appointed as a director. Minimum paid-up capital is 25% from IDR 10 billion. The registered office address must be in situated in a business or commercial area. In accordance to the Indonesian regulation, apartment or residential area can’t be used as an office address. The areas of business where a person can start a PT PMA is subject to the Negative Investment List. Specific license might be necessary for each specific sector. Some business activities require specific licenses before the company run its business while others may start their business immediately after incorporation. Regarding the Shareholders (other than the founders). This company is known as Local PT (Perseroan Terbatas). A majority of the companies in Indonesia are Local PT. It is a limited liability company that is fully owned by the Citizens of Indonesia as only Indonesian individuals or legal entities can be shareholders of a Local PT. However, foreigners who wish to acquire a Local PT can do so by purchasing over the Indonesian shareholder’s shares, be it part or all of the shares in the Local PT. This would mean that the legal entity of the company would have to be converted into a Foreign-owned Company (PT PMA) instead of Local PT. According to the business activities, there are several business fields which are closed for foreign ownership (check the updated negative investment list to see what the forbidden business fields are for foreigners). Local company is a great choice for foreign investors who wish to expand their business in Indonesia but is constrained by limited ownership for certain business areas. In a local PT company, it is also required to have at least 1 director, 1 commissioner and a minimum of 2 shareholders. The difference with PMA is only Indonesian citizens and/or Indonesian legal entities are allowed to hold shares as registered shareholders. To represent the company in performing all transactions and activities, there must be at least 1 director in local company, whose actions are supervised by at least 1 commissioner. If there are more than 1 director or 1 commissioner, they will comprise to be a Board of Directors or Board of Commissioners, with one of them acting as the President Director or President Commissioner. Small Trade Business License must be owned by a trading company whose the net worth (paid up capital) is more than IDR 50,000,000, up to IDR 500.000.000, excluding land and building of business premises. Medium Trade Business License must be owned by a trading company whose the net worth (paid up capital) is more than IDR 500.000.000, up to IDR 10.000.000.000, excluding land and building of business place. Large Trade Business License shall be owned by a trading company whose net worth (paid up capital) is more than IDR 10,000,000,000 excluding land and building of business premises. Note: To hire a foreign employee in local PT company, the required company size is medium with paid-in capital above IDR 1,100,000,000. The registered office address must be in business or commercial area. Apartment or residential area cannot use as an office address. Allowed activities Can manage all business activities within the business field subject to the Negative Investment List. Can carry out many business activities in various business fields. 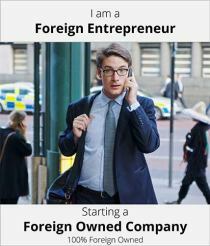 Ownership Foreign ownership can be anything from 0% to 100% depending on the business fields. The list of business fields that are not in Negative Investment List can be owned 100%. Shareholders must be 100% local citizens. Minimum Capital Minimum paid-up capital is 2.5 billion IDR (~175,000 USD). For some industries, the required capital is higher. Key Benefits Can operate fully as an independent limited liability company subject to the business fields stated in the Negative Investment List. Can conduct all business activities within the business field it got approval for. The company is required to provide reports on business activities to the BKPM every 3 months so that the BKPM may monitor the company’s development. No foreign shareholders and foreigners must apply to local shareholders for a reliable nominee agreement. Arrive and depart the country from one of the following ports of entry listed here. For foreign investors that are staying longer than 30 days, they will need to obtain the required visa. Acquiring a visa and stays permit would be a challenge in doing a business in Indonesia. There are two types of visa that are commonly used for foreigners who work in the business industries to stay in the country, i.e. the Business Visa and Working Visa. Before we incorporate your company, it is necessary for us at Paul Hype Page to know who you are through the Know Your Customer (KYC) process. The KYC refers to due diligence activities that all regulated companies must perform to ascertain relevant information from their clients for doing business with them. Being part of our internal process, once this is conducted, the credibility of you as an individual and a company grows little more. If foreign investors were to open a Local Company, PT in Indonesia, the ownership of the Local Company must consist of 100% local shareholders. This would create a major problem for foreign investors as they would have no rights in controlling the management of the company and to make decisions regarding the direction of the business. Foreign investors may think that they would be able to invest in companies they are interested in or are in huge demand in Indonesia. However, the Indonesian Government only allows foreign investors to invest in certain business sectors in accordance to the Indonesian’s Negative Investment List. The Negative Investment List states out the percentages of the ownership that are allowed for foreign investors in a business sectors or industries in Indonesia. Foreign investors are only capable of setting up a business in Indonesia via a foreign investment limited liability company (PT PMA) or through a Representative Office, (also known as Kantor Perwakilan Perusahaan Asing/KPPA). The local Indonesian law regulates and restricts the establishment of foreign businesses in the country for certain specific businesses in The Negative Investment List. For certain business such as Construction and Installation of High Voltage Electricity, The Negative Investment List 2016 opens only 49% of shareholdings for foreigners. Besides that, foreign investors would also be required to deposit a minimum of IDR 2.5 Billion USD 180,000.00) as a paid up capital requirement and this would cause a serious problem for many small foreign investors. The only way in which foreign investors could set up a Local Company, PT is to get a local nominee shareholder. This is not preferable by many foreign investors as the local nominee could claim the ownership rights of their share entirely and leave the foreign investor without giving him the opportunity to pursue legal action against the local nominee. Here at Paul Hype Page, we have offices set up overseas in neighbouring countries such as in Singapore and Malaysia. Instead of opening a corporate bank account in Indonesia, foreign investors could open a bank account overseas in Singapore to gain control of the company through the operations of the company’s bank overseas. For instance, Paul Hype Page has ties-up with DBS bank in Singapore for application for corporate account opening and regional payment services. Therefore, Paul Hype Page would be able to provide foreign investors with further assistance in incorporation of a Local Company, PT and to open a foreign company bank account. Due to the major inconvenience faced by small foreign investors in Indonesia on the minimum paid-up capital of USD 180,000.00 in Indonesia, Paul Hype Page have came up with a solution to help out foreign investors in regards to this matter. Here at Paul Hype Page, we would be able provide loans to assist foreign investors in covering the full amount of the deposit. By setting up another company in Singapore or Malaysia prior to setting up a company in Indonesia would also help foreign investors to effectively present the investment plan of IDR 10 billion (USD 750,000.00) as required by the Indonesia Law. Local citizens can work as any kind of jobs they want to Foreigners will need to obtain a Working Visa. Local citizen will not face difficulties in opening a bank account in Indonesia as there is no need of transferring funds in foreign currencies. It is difficult for foreign investors to find an efficient Indonesian business bank account for their company. DBS Bank has been named the ‘Safest Bank in Asia’ by Global Finance from year 2009 to 2017. DBS was also named the ‘World Best Digital Bank’ in year 2016 and 2018 and the ‘World’s Best SME Bank’ in 2018 by Euromoney. In Paul Hype Page and Co, we will adhere to all your administration and business needs in accordance with Indonesia regulations and requirements. Any queries could be assisted by our friendly and experienced Indonesian staffs in Indonesia. As Singapore’s NO. 1 company incorporation service provider, our dedicated and experienced Corporate Specialists are here to guide you through the entire Indonesia company incorporation process. We have 3 physical offices located in Indonesian, Malaysia and Singapore. We also have a virtual office in Korea. That means, coming in with Paul Hype Page & Co, do not only open you to the Indonesian client base, but open a possibility of conquering the Association of Southeast Asian Nations (ASEAN) region. Besides, Paul Hype Page & Co is one of the incorporation companies which have ties-up with DBS Bank for applications of corporate account opening and regional payment services. Contact us to get your business started in Indonesia today.